Inspired by the Buddhist Goddess Tara in her Green creative aspect - This deeply mysterious and sensual fragrance is rooted in sandalwood and benzoin. Labdanum and Oude wood add an intriguing exotic touch of warmth. Patchouli and vetiver add a subtle grounding influence. Rose opens up the heart chakra and allows bliss to enter in envelop us. Geranium, lavender, lemongrass, and bergamot add a touch of lightness to a very base heavy fragrance. Chinese peppercorn and frankincense delight your senses with a subtle and delicious spiciness. A fragrance that is perfect for all energy work, creativity, and meditation. Additional notes include amber, labdanum and lemon. Oh my, I will have to try this for sure…..sandalwood is hit and miss on me, but the rest of the notes sound right up my Bailiwick. Red Tara made me swoon and it sounds like this one will too! Oh, I will have to go peek at Red Tara! I quite liked Red Tara – knew nothing about it, though. 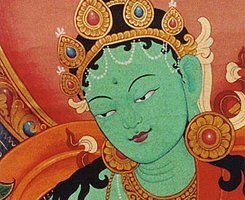 Green Tara sounds intriguing, both as a scent and a story. Oh Yeah. Rooted in sandalwood always piques my interest. Mmmm. This sounds wonderful, and the price is so refreshing. I like the prices too, although the sizes are small. Ava Luxe has the most wonderul scents, and this sounds lovely! This does sound lovely! I have yet to try any of her scents but must do so post-haste! Agreed! I’d like to try it. Love the picture you chose, Robin! This sounds delish. I’ve liked all the AL’s I’ve tried, even if I haven’t liked some of them on me. The bottles may be small, but it’s so much fun to buy a bunch of them at once and spend under $100. MKV- Haven’t seen you in awhile. How’s the new job going? This sounds absolutely delightful. In fact, I want one of everything from the oriental fragrance family. I already have my shopping cart full of $200+ of fragrance … now to prune that down. Something in Dzongkha smelled really bad on me – so now I’m wary of Buddhist references in perfume!